Local teachers work to create a handmade cooler using insulating materials during a PSCI-Train workshop designed to help their students understand how insulation works. A state Department of Education grant in support of a University of North Georgia (UNG) partnership with area schools has been increased from a projected $270,000 to an official amount of more than $320,000. The grant, which is awarded through the federal Mathematics and Science Partnership (MSP) program, funded $138,483 this past year and will fund $187,804 this year. The project being funded by the grant, known as PSCI-Train, was created to increase elementary students' science achievement by strengthening their teachers' content knowledge and teaching skills. The teachers learn instruction methods from UNG faculty, and the program involves Hall County Schools, Lumpkin County Schools, the Dahlonega-Lumpkin Chamber of Commerce and the Greater Hall Chamber of Commerce. "An increase of this significance in the grant funding is remarkable," said Dr. Susan Brandenburg-Ayres, dean of UNG's College of Education. "This is a tribute to the work of UNG faculty members Dr. Nelms, Dr. Choi, Dr. Spraker and public school teachers who are attacking increasingly complex math and science content and finding ways to make teaching and learning effective and exciting for high-need students in our region." 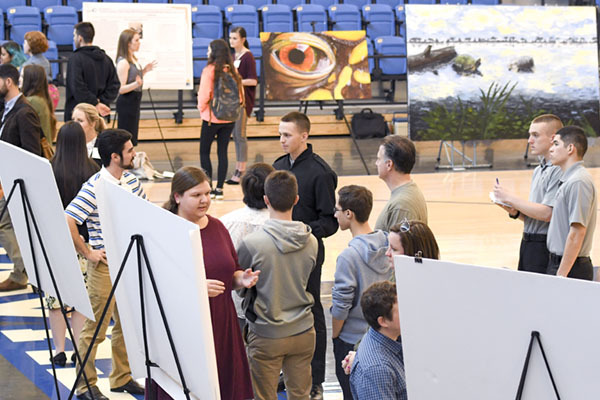 "The increase in funding will help us support several more initiatives, including a partnership with a Regional Education Service Agency to help the teachers earn a science endorsement," said Dr. April Nelms, assistant professor of science education at UNG and director of PSCI-Train. "It will also support the teachers in attending and hopefully presenting at the Georgia Science Teacher Conference." Also co-directing the project are Dr. Sanghee Choi, assistant professor of science education, and Dr. Mark Spraker, professor of physics. The professional development communities developed by UNG's College of Education place university students and their professors in K-12 classrooms in a two-year, full-immersion model. PSCI-Train is another step in the ongoing partnership UNG has with Hall and Lumpkin schools to provide field experience for the university's student teachers. Thirty-four local elementary school teachers completed the first year of PSCI-Train in June. The final, weeklong series of sessions helped the teachers connect content in energy conservation, waves, gravity, sound, light, electricity, magnetism, and thermal energy to their students. Dr. Jennifer Wade, a fifth-grade teacher at Lumpkin County Elementary, said when educators are able to use inquiry to tap into a deeper understanding of pedagogy, they are able to convey information to their students much more effectively. First-grade teacher Carol Duncan agreed. "Children are naturally curious, and hands-on activities encourage problem-solving skills that teach independence and perseverance," said Duncan, who teaches at Chestnut Mountain Creative School of Inquiry in Hall County. "Project-based learning is here to stay, and we are appreciative of the exciting materials we have been exposed to during these sessions." The MSP program encourages state agencies, universities and schools to forge partnerships to increase academic achievement by improving teacher knowledge. Georgia was allocated $6.3 million in MSP funds and received 28 project requests totaling more than $7 million. UNG's College of Education is committed to developing the skills and knowledge of individuals who wish to become a certified teacher or a health, physical education and recreation professional. For more information, visit: http://ung.edu/college-of-education/index.php.